I wasn’t isolated as a child, and I don’t have trouble fitting in with my peers now. I might be “weird” in some ways, and I might not fit in terribly well with groups that are too “normal,” but the points of difference and of commonality rarely have anything to do with educational background, now that I’m an adult. If I’m hanging out with people who are queer or feminists or radical leftists or geeks who share my specific geekery or yes, unschoolers, I feel perfectly at home. I often felt out of place in my teens, but that’s a feeling almost universal to teenagers, regardless of background, and I often found myself on the sidelines with fellow outcasts who did go to regular school, meaning I never really thought my education was to blame. That point seemed further proved by my unschooled sister, who was very outgoing and seemed to always find or make a friend group wherever she happened to find herself. Some kids find it easier to make friends than others, but as long as they have the opportunity to be around other kids, I don’t think it has much to do with education. On the other hand, right-wing Christian homeschoolers are often extremely insular, interacting only with others of their faith and politics, and seeing the broader culture as being filled with bad influences. Children raised to fear the other, raised in isolated surroundings, who don’t get to spend much time with other children (or at least children that aren’t exactly like them), are unlikely to be happy or emotionally healthy, and will be at a disadvantage when it comes time to merge with the broader culture. Isolation, whether from other people or from pop culture, is a bad thing. 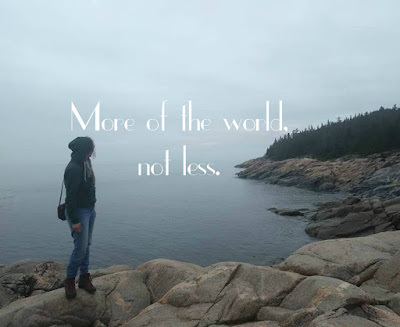 I think everything I’ve mentioned here can really be broken down between the two major groups of homeschoolers: those who want to give more of the world to their children, and those who want to restrict their children’s access to the world. This cuts across homeschooling approaches (though unschoolers obviously by majority fall into the first category), and seems from what I’ve witnessed to be the biggest indicator of whether a homeshooler has a good experience, or a bad one. Was it their parents’ intent in going school free to allow them more freedom, more exploration, more meaningful relationships, more engagement? Or was the purpose to isolate them from the “wrong” influences, “wrong” ideas, “wrong” people? Homeschooling shines when it’s embedded in the world, suffused with an excitement for discovery and learning. When it’s instead just a way to exert even greater control over children? Then it’s better labeled simply as abuse. Indeed! As an unschooler, what'cha gonna do, but get out into the world. The gang here is almost never home. When a CA state assemblyman proposed a law obligating homeschools to a fire marshall inspection once a year, one of my biggest concerns was the headache of having to be at the house. I love that the gang are getting to meet other kids and adults, and function in society, rather than a little boxy room locked in with folks exactly their own age. I love this post, I've thought about this so many times in our unschooling journey. My daughter is 17 and we've always unschooled, and so has our neighbor down the street. The only difference is our neighbor keeps her children inside isolated from the 'sins' of the world and plays the minister to them as she preaches at them all day long on the wickedness of the world. It's so sad to see the oldest one now, who is very gregarious and outgoing will just come outside and walk around the front yard in circles because he's so bored. They're a terrible example of what unschooling should look like. Oh, sounds terrible. I hope that they'll get a chance to go outside and actually explore the world in the future. I hope those children end up in the care of loving parents, instead of some crazy woman who's destroying her kids. Do you find it difficult to do things you don't want to after having an interest-led childhood? As someone who never particularly enjoyed learning about history, I think if I were to have been unschooled I wouldn't have ever bothered learning about it. I suspect I would also have a harder time doing unpleasant tasks at work or home. Even though I didn't decide on a career path until my second year of college, every option was open to me because I had what many considered a well rounded education. Is it the same with unschooling? I suspect you face a lot of adversity from those who don't understand the practice. I sincerely enjoy learning about those with different experiences than me and I hope that my comments did not seem rude or judgmental. Thanks! 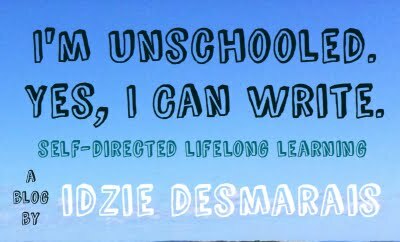 Unschooling is a lifestyle and way of approaching education, so not something that can just be fit in to the small time left over after school and on weekends. While self-directed learning is something everyone engages in, to greater or lesser extents, unschooling is the belief that ALL learning should be based on consent, and chosen by the learner themselves (with support from caring adults in their lives). This doesn't mean there's no structure, or classes, or teachers, just that unschoolers themselves decide when to utilize those resources (I have a post discussing structure in unschooling: http://yes-i-can-write.blogspot.com/2015/10/no-classes-no-teachers-no-books-reality.html). I'd like to respond to your criticism of, as you called it, religious homeschooling/unschooling, and perhaps give a different perspective. I was unschooled myself, in a completely religious environment. However, I had a totally different experience from those you're following on Facebook. Yes, we were shielded from 'screens' and 'the sins of the street'. No, we were not isolated in any way. We had a large community of like-minded people to interact with - and also not-so-like-minded people. We explored a huge variety of topics and interests, and never felt held back by our religious background. Yes, now, as an adult, I have exposed myself more (with full support from everyone around me, including the most devout), and the more I do so, the more I thank God every minute for the sheltered childhood I had. I'd like to suggest that those religious unschoolers you're following on Facebook are simply those who 'dropped out' of religion - for whatever reason, not necessarily because they were unschooled! Most religious unschoolers who've had a good experience (and I dare say that's the vast majority) simply don't take to Facebook (myself included). And saying that that prevents them from learning is again ascribing to regular schooling methods - that this way or that way will help you learn, and the other way won't... Hope I've made myself clear without being rude! I'd really appreciate your thoughts on this. In general I find your blogs great, thanks! To clarify, I'm not basing my thoughts only on people I follow on Twitter: growing up I knew many right-wing Christian homeschoolers (in fact, they made up the majority of the homeschooling groups I was a part of back then), and those I've been following more recently may have spurred this post, but they are not my main or only experience with this subset of homeschoolers. I'm glad you had a positive experience! But the conservative evangelical movement in North America is something I don't feel at all bad about criticizing. It is a large political force, one conservative homeschoolers are frequently active in, that pushes for a misogynistic, anti-LGBTQ, anti-immigrant, white supremacist agenda, and in my experience that is very much reflected in the way evangelical families live and raise their children. Child abuse, aka corporal punishment, has seemed in my experience to be ubiquitous. If this was not your experience, again, I'm really glad it wasn't! But that does not discount the very real harm the far-right Christian movement has done and continues to do both on a societal level and to individuals. I would also note that you seem to be implying that those who "dropped out" of religion are not accurate witnesses to their own lived experiences, that because they're no longer religious you think their experiences matter less, which is not a good implication. I appreciate you commenting, and I'm sorry if my reply seems harsh. But as a queer (far)leftist, and one who grew up surrounded by conservative Christian homeschoolers in my pre-teen years, I have strong feelings about this topic. And a further clarification that I'm very specifically talking about *right-wing/conservative* Christians, NOT all Christians or all religious people.